Israeli forces kill 3 as youth urged to join Great March of Return protests. Organisers dedicate Friday demonstration to “revolutionary youth” as Israeli forces wound at least 7 journalists covering the protests. At least three Palestinians were killed by Israeli forces as thousands of Palestinians participated in the fifth Friday of protests in the besieged Gaza Strip as part of the Great March of Return. The protests continue as the UN`s human rights chief slammed the Israeli army for the deplorable killing of at least 43 Palestinians in demonstrations over the past four weeks. The Gaza Ministry of Health said on Friday two slain Palestinians, including a man shot in the head, were killed in the east of Gaza City. The ministry could not immediately identify the two. A third slain Palestinian was identified by the ministry as 29-year-old Abd al-Salam Bakr, who was shot east of Khuzaa in the southern West Bank. The ministry also said that more than 600 people were wounded and included 37 injured from Israeli fire. Israeli forces were firing live ammunition and large amounts of tear gas towards demonstrators across the Gaza Strip throughout the day, an MEE correspondent reported. The Israeli military said 12,000-14,000 Gazans were participating in what it described as riots, and that some had tried to breach the border into Israel. It said troops had operated in accordance with the rules of engagement to stop people crossing the border. After dark, Hamas said an Israeli drone fired missiles at two boats moored off the Gaza shore and caused damage. No casualties were reported. The Israeli military said in a statement that its warplanes targeted six military targets belong to the Hamas terror organisation`s naval force in the Gaza Strip. It did not give the location of the targets. In separate incidents, at least seven journalists were injured by Israeli forces while covering the protests, according to sources on the ground. According to MEE`s correspondent, photojournalist Nabil Derbeih was shot in the head east of Jabaliya in northern Gaza, photographer Hashem Hamada was hit in the head with a tear gas canister east of Gaza City, while Abd al-Rahman al-Kahlout was shot in the foot in the same area. Photographer Mohammed al-Masri suffered from excessive tear gas inhalation in the Jabaliya area, while journalists Iyad Abu Ghaza and Hassan Youssef were also reportedly wounded after being directly targeted with tear gas canisters east of al-Bureij refugee camp. Meanwhile, Al Mayadeen news channel correspondent Lana Shaheen reportedly fainted after inhaling tear gas east of Gaza City. A press crew from Palestine TV was also said to be directly targeted by tear gas canisters, causing the team of journalists to suffer from excessive tear gas inhalation. Witnesses said at least two minors were shot in northern Gaza, including a teenage girl shot in the foot. The Gaza Ministry of Health also reported that a field clinic east of al-Bureij was targeted with tear gas, severely affecting four paramedics. According to the ministry, at least 349 Palestinians were wounded as of 6pm local time, including 19 minors and at least eight medics and three journalists. East of Gaza City and the town of Jabaliya in northern Gaza, protesters reportedly removed sections of barbed wire put there by Israeli forces to prevent demonstrators from getting too close to the borderline with Israel. For nearly a month, demonstrators have been gathering every day several hundred metres from the fence separating Israel from Gaza, where almost 1.3 million of the small territory’s two million inhabitants are refugees, to demand the right to return to their pre-1948 homes. The planned six-week protest is set to end on 15 May - the 70th anniversary of the Nakba (Catastrophe), in which more than 750,000 Palestinians were forced from their homes by Israeli forces during the 1948 Arab-Israeli war. Youth groups inside Gaza have backed organisers` calls to dedicate Friday`s protest to revolutionary youth and have encouraged young Palestinians to take part. The Israeli army’s Arabic language spokesman, Avichay Adraee, had called on Palestinian youth to stay home on Friday, a call the demonstrators rejected. “What future does Adraee talk about? They destroyed Gaza in 2014, and they deprive thousands of youth of travelling to receive education and treatment,” Bashar Abu Ras, 25, told MEE, laughing. More than 60 percent of Gaza’s population is under 24, while 56 percent of Gaza residents between the ages of 15 and 29 are unemployed, the highest rate of youth unemployment in the world according to the UN. Palestinians believe the nearly 11-year Israeli blockade on Gaza - also upheld by Egypt - has led to deteriorating economic and social conditions in the tiny coastal territory. We are besieged, we cannot travel to complete our studies abroad because of the Rafah border crossing [with Egypt] that opens only for humanitarian cases, and we cannot travel through the Erez checkpoint due to the Israeli security measures, Youssef Abu Hashish, 25, told Middle East Eye, adding that neither he nor two of his friends protesting with him had found jobs since they graduated from university two years ago, despite their best efforts. This is why we decided to protest, my friends and me, he said. This way we get to speak our mind to the occupation. Anwar al-Salhi, 29, said he lived from temporary job to temporary job, sometimes for as little as $7 a day, and was the family`s main breadwinner as his two brothers were unemployed. Al-Salhi said he had had a job opportunity in the southern West Bank city of Hebron, but lost it when Israel denied him an exit permit. The Palestinian parties have failed us by not being able to reconcile. We need to stand together against the Israeli occupation that stole our lands 70 years ago, besieges us, violates our rights, kills our children, and prevent us from seeing our families in the West Bank, al-Salhi told MEE. The occupation is the main reason why we have lost hope. We only have our voices to be heard and to break the world`s silence over the violations committed against us. We stand unarmed to peacefully protest in unison for our legitimate right of return. At least four children have been killed and 454 wounded by Israeli forces as of 23 April, the UN Office for the Coordination of Humanitarian Affairs said on Friday. But the US ambassador to the UN, Nikki Haley, echoed the Israeli government’s stance on Thursday by blaming Hamas, the ruling party in Gaza, for using children as cannon fodder. She accused the group, which is one of several political parties supporting the march, of using civilians as human shields in the protests. March organisers have repeatedly denied that Hamas was coordinating the protests and have emphasised that the tens of thousands of demonstrators have been largely peaceful. According to the Gaza health ministry, 43 Palestinians have been killed by Israeli forces since the beginning of the march on 30 March, and more than 5,500 have been wounded. The UN had tallied 42 Palestinian deaths not including Friday`s casualties, including individuals not involved in the demonstrations. No Israeli casualties have been reported. MEE correspondents have repeatedly witnessed Israeli forces targeting paramedics and journalists throughout the demonstrations. Two Palestinian journalists - Yasser Murtaja and Ahmad Abu Hussein - have been shot and killed since 30 March despite wearing clearly marked press jackets. The secretary-general for the Democratic Press Association in Gaza, Rami al-Sharafi, said Israel was sending a message that every journalist documenting the truth along the borderline [between Gaza and Israel] is an Israeli target. The Israeli army has rejected repeated pleas by the international community to use restraint and to conduct an independent inquiry into the deaths, maintaining the necessity of its open-fire policy. Meanwhile, Amnesty International has called for a global arms embargo against Israel, accusing its forces of carrying out a murderous assault against Palestinians in the Gaza Strip. Gaza`s health spokesman Ashraf al-Qidra said in a statement on Thursday that 21 injured Palestinians have had limbs amputated. Rights group Adalah has stated that a number of Palestinians had to undergo amputations after Israeli authorities denied them permits to travel to the occupied West Bank for treatment, as hospitals in besieged Gaza have struggled to cope with the number of injuries in the past month. The UN`s high commissioner for human rights meanwhile said on Friday that Israel must stop the excessive use of force and must hold to account those responsible for the deaths in the marches. 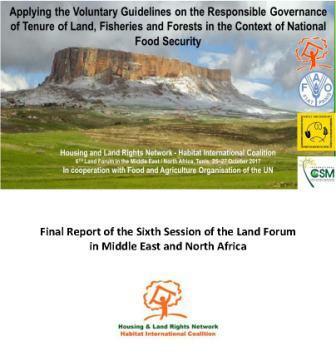 Zeid Raad al-Hussein said: The loss of life is deplorable, and the staggering number of injuries caused by live ammunition only confirms the sense that excessive force has been used against demonstrators – not once, not twice, but repeatedly. It is difficult to see how children, even those throwing stones, can present a threat of imminent death or serious injury to heavily protected security force personnel. Additional reporting by Amjad Ayman in Gaza. Photo: Great March of Return protesters reach Israeli-installed razor wire barrier inside the Gaza Strip. Source: Palestine Chronicle. 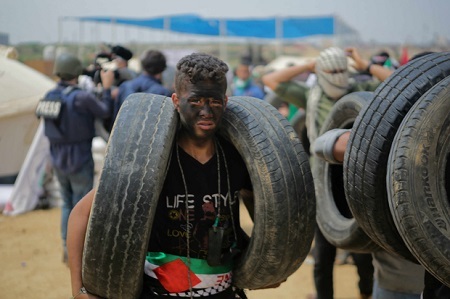 Photo on this page: A young Palestinian carries tyres to burn at the Great March of Return` demonstration on 27 April 2018. Source: Mohammed al-Hajjar/MEE.